A social welfare project that provides emergency support to people in food crisis has been awarded a £400 donation. The Somer Valley Foodbank, which has fed over 6,000 people since it was launched in 2013, was presented with a £400 cheque last week by the organisers of Peasedown St John’s Party in the Park Festival. Volunteers from the Foodbank spent a day at the Summer spectacular on June 9th offering their services with gate marshalling and other duties. Foodbanks provide three days of emergency food to people who need it the most. Professionals such as health visitors, social workers and Citizens’ Advice identify people in crisis and issue them with a Foodbank voucher. The voucher can be taken to a Foodbank distribution centre where a friendly team of volunteers will offer a cup of tea and help people with their food needs. The Foodbank’s operational costs are much more than people would think, with over £6,000 a year needed to pay the rent at the project’s Warehouse where non-perishable foods are stored. 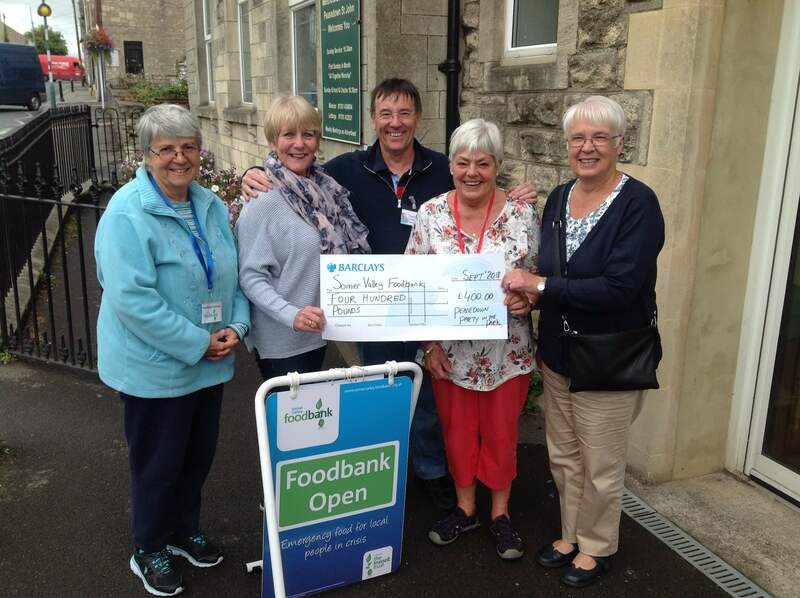 The photo shows Karen Walker (second left) and Joy Fraser (right) award the cheque to Barbara Bailey, Paul Woodland and Maureen Byrne from the Somer Valley Foodbank Team at Peasedown St John Methodist Church last week.